Hey there friends! This month The Cut Shoppe is teaming up with Creative Scrappers so I have a bonus layout to share with you today! We are working with Sketch #305 this month. I started in Cricut Design Space with the Heart Eyes Cut File. I sliced out the sentiment from one of the open hearts. I then copied & pasted the heart 3 times. I sized them to fit onto a 12×12 layout and welded two of the hearts together. I then used the “all the heart eyes” heart for the title of my layout. I cut all of the hearts on 6×6 pattern papers from the Amy Tangerine On A Whim Collection, but before adhering the hearts to the layout I wanted to add a little mixed media to the white cardstock base. I did not use any gesso on this layout because I knew I would be adding a lot of water and I wasn’t planning on blending multiple colors. I went to my go-to No Yoking Coloringz from Shimmerz and applied the color to the white cardstock using the packaging technique. After the mixed media was dry I adhered the hearts to the background. I also added hand stitching around each of the hearts. I used multiple color threads on the heart with the sentiment because it had an ombre effect. If you’ve ever done hand stitching you understand that it can be quite time consuming, but I always love the look! I didn’t want to take away from the hand stitching so I added very few embellishments to the layout. I used ephemera & chipboard pieces from the Amy Tangerine On A Whim Collection and also a few stickers from the Simple Stories Carpe Diem Collection. For final touches I added my journaling using my We R Memory Keepers Typecast Typewriter and a few Heidi Swapp Hot Pink Color Shine splatters. This photo was taken on a car ride home from school one day. My niece snapped it in the car and I knew that I had to print it off and scrapbook it! How cute are they with their Snapchat puppy faces! Now you can take a look at the process video that also includes a Cricut Design Space tutorial! You can join in the sketch challenge fun by creating a layout and sharing on Instagram with the hashtags #CSSketch305 and #CreatingWithSketches. 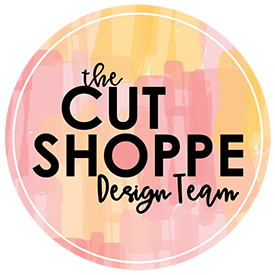 Also remember to check out all of the cut files in The Cut Shoppe Etsy Store!